He arrived on our ramp one summer afternoon in a spanking new Cherokee Six 300. I met him as he climbed down from the wing, a small man, portly, thirtyish, a nondescript appearance accented by the pipe protruding from his round face. He shook my hand and introduced himself and I smiled back, completely clueless about how this man was going to change my career in aviation forever and put my life in a spin. This was the mid seventies and I'd been on a wild ride in the aviation business for the past few years. The little flying school that I'd started at a small grass field in Buckhannon some years back had exploded with activity and when the opportunity came to bid on the FBO at a large airport in Northern West Virginia, I jumped at it. This airport had paved runways a mile long, a Flight Service and even (gasp) a tower. This airport would be perfect for the growth I wanted to achieve. This airport, I thought, would by the key to sucess. My company quickly secured a Piper dealership and added a half dozen new Cherokees to the flight school, which thanks to the GI Bill and a good advertising program was going gangbusters. Our shop too became busy, not only with the maintenance on our own fleet, but providing service to aircraft owners from the Tri State area. We had received our 135 certificate while still in Buckhannon, but once we were settled in our new 'big city' home, that part of the business rapidly expanded until we were flying two Aztec's, a Seneca and a Navajo, providing Air Taxi, as it was called at that time, to many of the local business folk. We were mortgaged to the hilt, but we were doing a good business and just as happy as clams. A charitable description of my reaction to the sudden change from a mom and pop flying business to a good sized and modern FBO would be to say that I was hanging on and doing the best I could. I certainly had no business background to prepare me for what I now found myself doing, but we were muddling along and succeeding, I suspect in spite of us. Looking back, I think one of the few things that I did right during this time was to hire good people to run the different parts of the business. Charter, aircraft sales, flight training and maintenance are the pillars upon which a successful Fixed Base Operation stands, and all of the experts that I convinced to come to work for us and oversee those departments were specialists in their particular field. Each part of the business was doing what it was supposed to. Doing not so well was the accounting department, which contained a book keeper, a secretary and sometimes me. No one in the organization, including me, probably especially me, had any experience running a business the size that this one had suddenly morphed into. We suddenly had fifteen employees, money was flying in and flying back out again, and I was regarding the whole process rather dazedly. Serendipitous occasions I've found, can work in both good and bad ways. Serendipitous it was then, when Leroy appeared on my ramp. I was not to find out until much later that it was not the good kind. Leroy, it seemed was from Baltimore. He said he was a CPA who had made a lot of money from investments and was now working as an accountant in the world of high fashion clothing. He was doing this not because he needed to work, but because he wanted to stay busy. However, Leroy's real love was aviation and he longed to be involved in it, to be a part of the world of aviation. His dream, he told me during the course of the several conversations that were to follow this meeting, was to find an aviation business that needed his talent and to give them an unbelievable bargain, hiring his expertise for a pittance in exchange for him being able to work in the aviation industry. Hmm, I thought. I am the ideal recipient of this amazing talent, and this is indeed a match made in heaven. How wonderful, I thought. We could provide him with a genuine aviation experience par excellence, while he provided us with the missing and mysterious accounting knowledge that we needed to sort out the mess in the office. This is where the little light should have come on, but apparently the bulb had burned out. After a few weeks, many phone conversations and a couple more visits by Leroy via the gleaming Six, we struck a deal. He would come and work with our burgeoning flying service at a salary that was perhaps half what it would take to employ an ordinary CPA. An ordinary CPA would be one without the frenzy to be in with the aviation in crowd and perhaps, as I was to later think, one without ulterior motives. In no time at all Leroy had quit his Baltimore job and moved into town. He bought a house and returned to Baltimore to marry and import a new wife to his new life in West Virginia. In a few months things had settled down to the routine of having an accountant in the office. The bills were getting paid and the office was running smoothly and I could concentrate on the myriad of other details that are involved in running a flying business. What a relief. No longer did I have to fret about who to pay and when to pay them because Leroy handled all these things. I no longer had to worry about withholding taxes and sales tax and payroll because Leroy was on top of it. He became a familiar figure shuffling around the office, trailing a plume of fragrant pipe smoke and he seemed to be well liked by the staff and the students and customers who were constantly in and out of the office. One day after being with us for six months or so, Leroy made me a proposal. He wanted to use his Cherokee Six and fly the body transport that the company was doing for the funeral homes. He pitched that he would subcontract with us and we would still make money on the flying, but wouldn't have to worry about the details. This actually made sense to me, because the Six was the ideal aircraft for this mission. We didn't have one on the line and were using the Seneca at a higher operating cost. I knew he missed flying and I think probably because I felt guilty about paying him so much less that he was worth, I agreed to the plan. He said he would do most of the trips at night, so his office duties wouldn't suffer. Time slipped by and Leroy did his transports and the whole company stayed busy. Our flying hours were increasing each month and finally that October they hit the magic 1000 hour mark. We were flying up a storm in both the flight school and the charter department. Our trainers were in the air from morning until well after dark and charter trips were coming in by the score. The business was humming like a well oiled machine, but something strange had begun happening. We started getting calls from vendors complaining about slow pay or in some cases no pay. Meetings with Leroy confirmed that in spite of all the flying we were doing, there were more bills than there was money to pay them. How strange was this? About the time we started to have cash flow problems, Leroy confided to me that he had personally had a stroke of luck. It seems his old company in Baltimore had called and asked if he would consider flying software patterns to their plants in different parts of the country. This would require a twin for the mission, but he was willing to upgrade his aircraft and accept the contract. Happy that someone was having good fortune, I agreed to let Leroy accept it and still keep his position with the company, although it meant he would be gone more than with the body transport trips. It wasn't long then until Leroy appeared with an almost new Cessna 310Q. It stood tall and proud on our ramp, making our Pipers look just a little dumpy and I confess that I experienced just a twinge of jealousy. He then explained that because the company wanted him to present a professional appearance, he got fitted for an airline pilot's uniform, complete with four stripes and epaulets. When the suit arrived he shared with us that the company needed him to have his portrait taken by a professional photographer, standing in front of the 310 and resplendent in his pilot finery, presumably for the company brochure. 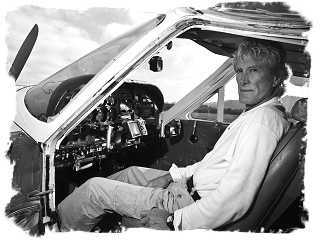 By now the whole airport was taking notice of Leroy and we all watched as an instructor, specializing in 310 training and flown in by Leroy from somewhere in the West, gave him training in the Cessna and he became multi engine rated and qualified in the airplane. A large leather briefcase appeared and became part of Leroy's reata and was almost always at his side. He once let us peek inside and we saw sealed manila envelopes that he confided held the patterns for the sewing factories, very secret patterns and much sought after by competing fashion manufactures. The trips to deliver the patterns began and over the next several months they ranged the length and breadth of the US. The 310 would come and go, Leroy always with the mysterious briefcase present, its importance giving the impression that it was just this side of being handcuffed to his arm. On one trip he flew to California, but the company president, who needed to meet personally with Leroy, happened to be in Hawaii. He stated that he had no choice but to jump on an airliner, briefcase in hand and jet on over to the island to meet with the CEO. Meanwhile our cash flow seemed to be flowing mostly in the out direction and calls from angry vendors were increasing at an alarming rate. I contacted an accountant friend who came in and looked through the books and appeared as baffled as I. One thing for certain, he told me, unless we changed something drastically, we couldn't continue in the direction we were heading. .blank paper. Each envelope was filled with about twenty sheets of blank paper. We stood looking at each other, all of us struggling to get our minds around the fact that all of this had been make believe. It had been a play, written by and starring 'Leroy the Professional Pilot' and our company was the unwitting producer. There was no contract; no company, no factories and the flights had been to random destinations, delivering nothing. It was an incredible, sick production, enabling Leroy to act out a role that he had obviously needed to cast himself in. He was never found. He was indicted by the county Grand Jury and the story made the papers for a while and then was forgotten. He was traced to California, but there the trail grew cold. Our company declared bankruptcy and all of the employees, me included, were out on the street. I went to work for the Cessna factory as a multi engine demonstration pilot and the other employees eventually moved on, most to other work in aviation. An exciting chapter with a sad ending had closed in all our lives. These days I sometimes run into people from the old FBO, since most of us stayed in aviation and it is after all, a small world. Talk usually turns to the old days, as it does with people of a certain age, and when it does, almost without exception, we reminisce about the strange little man who took an entire airport for a ride.